• Will you play as a soldier who shoots first and asks questions later? • A stealthy scientist who uses chloroform and tranquilizer darts to silently take down the opposition? • A genial bartender who can talk his way past the most intimidating of guards? • Or how about a hyper-intelligent gorilla, rescuing other caged gorillas to form a small mobilized gorilla army? • Play the game YOUR way! Don't want to kill anybody? That's cool! Want to hack computers? Got ya covered! • Random world generation and TOTALLY EXTREME gameplay variety means you can play for 600 hours and not get bored! Seriously though, go outside!!! • Super-advanced artificial intelligence that won't put up with your crap! Outsmart these virtual humans and feel superior to your computer! • Play as over 20 (and growing!) wildly different types of characters! Bartender, scientist, hacker, gorilla — hey, your job is probably in there too! • Stupidly huge variety of items! Shrink rays, hypnotizing devices, boomboxes, bear traps, food processors.. Oh, and guns too. 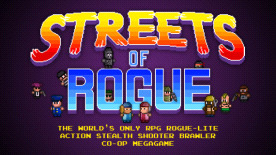 • 4-Player online and local cooperative modes lets you brutalize goons AND loneliness! • Lead a gang, free slaves, drink beer, gib ghosts, become a vampire, shrink people and stomp on them. The most insanely varied game ever made.